WINNEPEG, Canada — Basketball legend, Magic Johnson, has been named the keynote speaker at the 42nd annual “Y” Sports Dinner to be held in Winnepeg, Canada. Johnson is scheduled to speak at the June 19 Convention Centre gala, which will raise money for scholarships and programs at the Rady JCC. Photo shows Magic Johnson delivering the keynote speech at the National Cowboy and Western Heritage Museum for the Champions of Health Gala supporting Oklahoma Caring Foundation. Johnson, a former forward for the Los Angeles Lakers, led the Lakers to five NBA titles. He was part of the Olympic ‘Dream Team’ in 1992 and was inducted into the Basketball Hall of Fame in 2002. Johnson is also known for going public after he was diagnosed with HIV. By going public, he helped turn the tide of the stigma against people living with HIV. Since then, he has become a vocal advocate of HIV prevention and awareness, and has championed development programs in poor urban neighborhoods. Watch the following video showing NBA Legend Magic Johnson as the keynote speaker at the National Cowboy and Western Heritage Museum for the Champions of Health Gala supporting Oklahoma Caring Foundation. Sports Speakers 360 is a booking agent for motivational sports speakers. 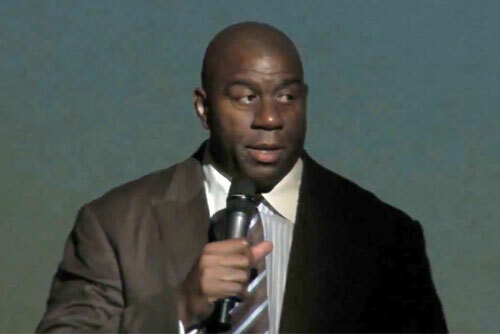 If you would like to book athletes like Magic Johnson for a speaking engagement, autograph signing, guest appearance, product endorsement, charity fundraiser or corporate event, contact our booking agent for appearance and speaker fees or call 1.855.303.5450.